In recent speech to UN General Assembly, 'moderate' Palestinian Authority leader makes his ultimate intentions clear. Palestinian Authority leader Mahmoud Abbas continued his diplomatic offensive against Israel last week at the United Nations General Assembly, leveling a wide range of accusations against the Jewish state and calling for an international "protection regime" for Palestinians. But amidst all the usual bluster, many observers missed a subtle, yet crucial, theme within Abbas's speech: That far from the "moderate" image he has cultivated, he views all of Israel as "occupied" and illegitimate, and aspires to the destruction of the country in its entirety. At one point, in comments broadcast live on PA TV and highlighted by Palestinian Media Watch (PMW), Abbas referred to Israel's "67-year occupation" - referring not to the "West Bank" (Judea and Samaria), but to the very founding of the State of Israel in 1948. "Mr. President, ladies and gentlemen, haven't you wondered: For how long will this protracted Israeli occupation of our land last? After 67 years (i.e., Israel's creation), how long? Do you think it can last, and that it benefits the Palestinian people?" Abbas asked. 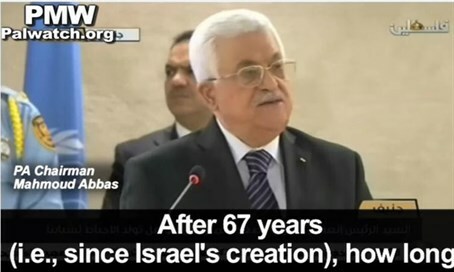 Later on in his address, Abbas returned to that theme, speaking of "[The] holy sites which have been desecrated every other second again and again for seven decades [emphasis added] now under an occupation that does not quit killing, torturing, looting and imprisoning..."
Interestingly, PMW revealed that the PA's official Wafa news agency attempted to airbrush Abbas's initial statement, mistranslating it as: "Ladies and gentlemen, haven't you wondered; for how long will this protracted Israeli occupation of our land last?" Official PA organs regularly re-write officials' speeches after the event to cover up gaffs or incriminating statements. Most recently, the official website of the Palestine Liberation Organization (PLO) - the body which runs the PA - retroactively re-wrote a televised address given by Abbas in which he erroneously claimed that Israel had "executed" a teenage terrorist, who was later revealed as being alive and well in an Israeli hospital. Abbas's Freudian slip will not be surprising to observers who follow statements by the PA, PLO or Fatah party in Arabic, however. Far from the "moderate" image often portrayed in the west, Palestinian officials regularly make clear that they view any "two-state solution" as merely "the first stage" in annihilating Israel entirely. As highlighted by PMW, the PA's own "National Security Force" regularly portrays places in "pre-67 Israel" as parts of "Palestine." "In the last week alone, the PA Security Forces presented Israeli cities Ashkelon, Haifa and Acre as 'occupied,'" as well as multiple maps of "Palestine" which feature the entire map of Israel, it noted. Fatah and the PA have played a similar game vis-a-vis the ongoing wave of Arab terrorism sweeping Israel, playing down the attacks in English while actively encouraging them in Arabic statements and particularly on social media.